I’ve rarely had a hard time counting my blessings. In the almost 62 years I’ve been on this earth, they have always been more abundant than I deserve. My kids and grandkids are all happy and healthy. And the two oldest grands are completely potty-trained. Despite the rancor and divisiveness of the recent campaign for President, most of the people I know continue to treat each other with dignity and respect. I get to take yoga from Nicole at Synergy Studio every Wednesday morning. I’ve celebrated this year’s “super moons” in a number of unforgettable ways. The Chicago Cubs finally won the World Series. Though I’m a Braves fan to my core, who wouldn’t be thrilled about ending a losing streak as long as the Cubbies’? I’ve read several good novels and three outstanding ones: “Still Life with Bread Crumbs” by Anna Quindlen, “The Invention of Wings” by Sue Monk Kidd and “Our Souls at Night” by Kent Haruf. Whenever the news makes me wring my hands in despair, I can always switch over to Netflix and watch reruns of Andy Griffith. 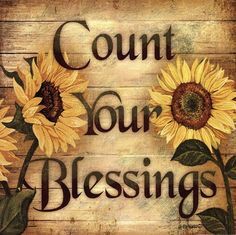 Here’s hoping that you, too, are able to count your many blessings during this season of Thanksgiving and in the year ahead.